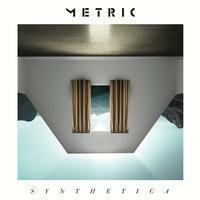 If 2009's Fantasies was about escaping the familiar and exploring the world, Metric's Synthetica is about finding the courage to stay home and deal with your own reflection in the mirror. "It's about facing what you know is true," says Metric frontwoman Emily Haines. The band — Haines, Shaw, bassist Joshua Winstead and drummer Joules Scott Key — started work on the album literally the day after their final Fantasies show at the Art Basel modern art festival in Miami at the end of November 2010. They returned to Giant Studios in Toronto. They were emboldened by their fourth album's success (nearly 500,000 albums and more than one million singles sold worldwide) and thinking big. But the real breakthrough came when pieces of vintage gear began fortuitously falling into their laps. Guitarist-producer Jimmy Shaw puts it this way, "Synthetica is the sonic culmination of everything we have done. We've always had a sound in our heads that we hoped to realize. We finally heard it coming out of the speakers this time. It's futuristic and synthesized and yet organic." The album was mixed by Grammy-nominated, indie-rock specialist John O'Mahony.